"I met this beautiful nurse out in California." 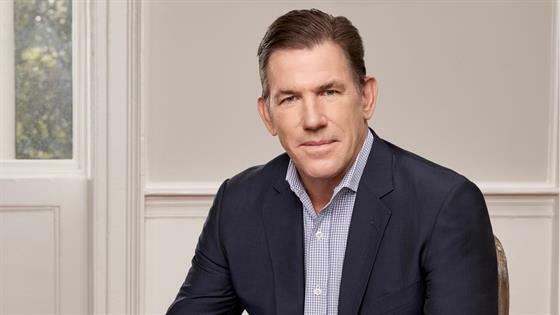 That is how the complicated romance of Thomas Ravenel and Ashley Jacobs first began, as Thomas detailed in the Southern Charm season five premiere. The couple met at a bar in May 2017, and as Thomas explained, "We've been together ever since." He's not lying: Ashley, who was living in Santa Barbara, moved to Charleston, South Carolina, to be with Thomas, joining the Bravo reality hit in the process. And man, did she make an entrance, quickly becoming Southern Charm's new villain, thanks to her verbal attacks on Kathryn Dennis, the mother of Thomas' two children, daughter Kensington Calhoun Ravenel, 4, and son Saint Julien Rembert Ravenel, 3, and questionable motives for moving to Charleston. "She didn't come here for love," Kathryn, who learned Thomas was dating Ashley when her daughter revealed they were sleeping in the same bed, said in the premiere, which aired in April 2018. "No one buys that s—t for a damn second." Sure, viewers had seen a rollercoaster romance on the show before, with Thomas and Kathryn's tumultuous romance and custody battles dominating storylines for the majority of the previous four seasons, but no one was quite prepared for the ups and downs of Thomas and Ashley's whirlwind relationship—on and off screen. Thomas, the former state treasurer who spent 10 months in prison in 2007 for drug charges, was accused of sexual assault by two women, including a former nanny that had previously worked for him and Kathryn, in May, with the reality star denying the allegations. His attorney, Richard P. Terbrusch, told E! News in a statement, "My client enjoys a certain degree of fame and unfortunately has become—unfairly—a target for an individual who has, in my opinion, dubious motivations." At the time, Bravo issued a statement, saying, "Haymaker, the production company for Southern Charm, and Bravo take allegations like these very seriously. Haymaker is conducting an investigation, and once all the information is gathered and carefully reviewed, appropriate action will be taken." Throughout all of this, Ashley stayed by his side. After the sexual assault allegations, Thomas did not end up attending the reunion, which was taped on June 12 and aired in mid-July, with Andy Cohen reading a statement provided by his attorney. "Along with Bravo, our client made the mutual decision not to attend today's reunion taping as there is a pending investigation," the statement said. "Our client is fully cooperating with authorities on that investigation. He expects to be completely vindicated once the investigation is concluded. He sends his best regards to his fans and his fellow castmates." Kathryn chose not to comment on the allegations, telling Andy, "I'm not going to comment until I guess it's resolved I think. What I am going to focus on is just the children and staying out of it." As for her cast members, Shep Rose said, "Ninety percent of the time, Thomas is funny, eccentric, jovial and then we've seen there's a side of him that is not really him. There's a big part of him that I really, really love and a little part that I don't." Still, while her boyfriend was not present at the taping because of the , a visibly nervous Ashley did attend, and was shown preparing to face the cast while getting her hair and make-up done during the first part. When she did finally join the cast on the set, was asked if she expected Thomas to be cleared in the investigation, which was still ongoing at the time. "Of course, yes," she responded. "He has not been charged with anything. These are just allegations." As for how Thomas was handling the investigation, Ashley said the experience had changed him. "I have seen a new Thomas. It's humbling, of course, and now he's, ‘Let's stay in, let's watch movies, let's cook dinner…'" Ashley said. "I've seen a much softer, more sensitive, kinder, more supportive boyfriend. Everyone wants to be with you when you're on top. But it's who's with you when you're down there. I've told him I'm not leaving." But the reunion turned into a mini-intervention of sorts, with the women trying to get Ashley to realize her relationship with Thomas may not be the healthiest, with cast member Chelsea Meissner earlier revealing someone told her they witnessed Thomas throwing his leftovers at Ashley while leaving a restaurant, allegedly yelling, "You're going to send me back to prison." The women also highlighted some of Thomas' behavior over the course of the season, including his verbal rant against Chelsea during the group's trip to Hilton Head (where Ashley's infamous dinner conversation with Kathryn also went down). "I think she's terrified of him," Cameran Eubanks said, which Ashley denied, while Craig Conover said she seemed "brain-washed" by T-Rav. And when several of the cast members pointed out that he often seemed to bait her during the season, Ashley responded, "It's just entertainment to me." For Cameran, it seemed like their relationship and Ashley's behavior was "the whole Kathryn situation all over again," which she denied. "You don't know what happens behind closed doors," she said. "Don't judge, don't you dare judge." When the cast brought up the rumors that had been going around Charleston about their "volatile" relationship, including the leftovers story, which Ashley tried to clarify: "He did not throw it at me. He was upset because I was leaving and I handed him the food and I was being a brat. It was my fault." When the cast pointed out that she seemed like she was in denial and that she didn't seem well, she joked, "Is this an intervention you guys?" She then asked them to "please trust my judgment." But it seems like the reunion may have caused a shift in their relationship. At least a temporary one. On August 6, Ashley had allegedly told the host of the Reality Life With Kate Casey podcast that she and Thomas had broken up. While Ashley did not appear on the podcast, Casey Casey said heard the news straight from Ashley herself, who allegedly took responsibility for breaking things off with Thomas and said she's since blocked his number. As for Ashley, she decided to post a somewhat cyrptic Instagram photo, captioning a picture of South Carolina's great outdoors, with "Difficult roads often lead to beautiful destinations. #TrustGod." She also responded to a fan asking for an update on their relationship, saying, "Sorry for any confusion. I don't plan on addressing rumors or talking about my relationship status to social media at this time." However, a few days later, a source told us not to count out a reconciliation. Or another break-up. "They have been doing this a lot lately," the insider shared. "It's always up and down and they fight a lot. They find a way to lure one another back in." And then a few days after that back and forth (and just one month after the reunion episodes aired) Thomas made the announcement on his then-private Twitter page that he was leaving Southern Charm after five seasons. Thomas' exit came after a source told E! News the rest of the cast had shunned him from the group after choosing to stay with Ashley after her treatment of Kathryn. Our source added, "Everyone is on Kathryn's side for things and does not want to be affiliated with Thomas." Around the same time as Thomas' tweet, Ashley decided to delete all of her Instagram posts from the last year, declaring the start of a new chapter in her life. It seemed like she considered her treatment of Kathryn during the season one of those failures, as she issued her a public apology in August. "I owe you all an apology," Ashley wrote on Instagram. "I'd like to apologize for how I treated Kathryn, and how badly I disrespected her. I'm not sure what made me think it was OK to speak to a mother that way. It wasn't. It was not my place to say anything at all, much less the reckless comments I made. I crossed a line and hurt people who don't deserve it." Kathryn's response? "Are you kidding me?" The public apology came after Ashley revealed on Instagram Live that she and Thomas had broken up, according to People, saying, "Before I say too much, I love Thomas and I'll always love Thomas. I'll always care about him." She then hinted she was ready to date again, telling her followers, "You guys know some eligible bachelors, hook me up. They don't have to have money. I'm OK with that. I just want someone to love me for me. It's never been about money. Like I said, I work hard. I wouldn't quit my job. I drive my cute little Honda. I'm okay." On September 25, Thomas was arrested in Charleston County, S.C. on charges of alleged assault and battery second degree, and was was later given a $20,000 personal recognizance bond and, as a condition of the bond, surrendered his passport. According to an affidavit filed just before his arrest, the investigating officer testified that the unnamed victim was working as a nanny for Ravenel in Charleston in January 2015 when he allegedly undressed and made sexual advances toward her. Soon after the news of his arrest went publis, his accuser, dubbed "Nanny Dawn," spoke out about her decision to press charges against the reality star. "This is about a lot of different women in this maybe a start, If you can take down somebody who has this kind of notoriety and has fame, has fortune, maybe it'll give a little bit of faith to somebody else that there will be justice for them too," she said on the podcast, Pink Shade With Erin Martin. Thomas' lawyer soon spoke out, calling Thomas was "a vulnerable target" for these kind of accusations, which he has always denied. "The person this woman describes is simply not the man that I know. My client is a loving father, successful businessman and upright member of the community," his attorney's statement to People continued. "He is appalled and hurt by these allegations—and is committed to defending his reputation in the appropriate legal forum." And in the aftermath of his arrest, a source told E! News that Ashley and Thomas had " very quietly" rekindled their relationship and that she was "standing by Thomas." With their relationship in good standing, the insider said, "Thomas is in good spirits all things considered. He believes he is innocent and wants the process to speed up so he can clear his name. He thinks he will be exonerated." In late October, Kathryn filed a motion seeking primary custody of their two kids, and in the filing, obtained by People, she alleged that her ex had displayed "periods of impulsive and uncontrollable bouts of anger" as well as "extreme narcissism and anger management problems." The outlet also reports that Dennis accused Ravenel of relying "upon the use of full-time nannies" and claimed that he "has drunk alcohol to excess, mixed with prescription drugs, that has caused him to be impaired during periods of time in which he had custody of the children." Ashley was also mentioned in her filing, with Kathryn alleging that Thomas encouraged his on-and-off partner to "verbally assault and attack" her on the show. Soon after, Thomas filed a counterclaim,obtained by People, in which he accused the 27-year-old of filing the motion "in bad faith, for the purpose of garnering media attention, creating material for her storyline on Southern Charm and ensuring her marketability as a 'reality TV star.'" "Thomas is not necessarily worried about his assault case, but this is stress he doesn't need," a source told E! News at the time. "He thinks Kathryn is trying to take advantage of his legal issues." The source continued, "They still communicate regarding the kids – their schedule and things like that. It's not so contentious that they're not speaking but it could reach that point if things continue like this." But on Nov. 12, in an Instagram post that has since been deleted, Thomas accused Ashley of "bad mouthing" Kathryn, going on to beg her to stop talking about the mother of his children. "Ashley Jacobd [sic] has been bad mouthing the mother of my children. I totally disavow this horrendous behavior and will have nothing to do with her," he wrote. ""I begged her over and over to no avail. So hateful. Hope she gets help." Then, in early November, it was time for the preliminary hearing in regards to Thomas' arrest on charges of alleged assault and battery second degree, with a judge finding probable cause to move forward with a trial. Still, a source told E! News that "Thomas is not worried about the case moving forward. He thinks he has a great attorney and that he will be cleared. He is not that stressed about it." Just one day later, Ashley took to Instagram to announce she would not be returning to Southern Charm, despite never being a full-time cast member. "After a lot of prayerful consideration, I have decided not to return to Southern Charm next season," she wrote. "I've been blessed with an amazing career, family, & friends and I don't want to put those things in jeopardy for a reality tv show. Honestly I considered filming again because I desperately want to tell my side of the story. But after experiencing how unfair the editing process can be, I don't think I'll ever have a fair shot," Jacobs continued. "I appreciate you all following me throughout this journey." When a commenter questioned whether she really had "a choice" about her future on the show, Ashley responded, "You really think producers would want to remove all the drama from the show? You do realize it helps the ratings." And despite his Instagram post earlier in the month about "having nothing to do with her" moving forward, Ashley said she was "lucky" to have met Thomas in an Instagram collage post on Thanksgiving. "For all the crap we went through together this past year, the good really does outweigh the bad," Jacobs wrote in the caption, according to People. "You can't go through stuff like that and just pretend like it never happened, like the person that got you through some of the toughest times of your life now means nothing to you." She added, "You were my boyfriend during a time in my life when I needed you and you needed me. I don't know how much I believe in the idea of fate, but if it exists, I know it brought you and me together for a reason… even if we weren't made to last forever." The caption seemed to confirm their most recent split was permanent, as Ashley wrote, "We might not be creating new memories anymore, but I still treasure the ones we have, and I'd do it all again knowing how things turned out in the end. Thank you for the memories, the good and the bad, and I'll forever cherish them till the day I leave this world." She ended the post by writing, I was lucky to have met you, Thomas. I look forward to being good friends for a long, long time…"
While Ashley is saying goodbye to one (televised) chapter of her life, she is looking to to future, celebrating her birthday on December 1. "Hope 34 is a lot better than 33!" Jacobs wrote on Instagram.